A recent requirement for a conceptual figure provides a mini case study on how to adapt a file from the online image library to suit your exact needs. Pierluigi required an image to highlight dopaminergic pathways in the brain for a journal article that had to be submitted that day. He identified one of the images on the neurographical instagram feed (image shown below left) as being the type of figure he needed. That image was re-drawn by Gill from an existing conceptual figure and so cannot be used in another article within permission from the copyright owner. However, there was already an image available in the image library that shows a very similar view of the brain (below right) and that could be adapted for Pierluigi’s article. Retrieving the Adobe Illustrator file for this image allows you to edit and adapt it to provide the required image. Each of the elements making up the image is on a separate layer in Illustrator, as can be seen below, and so the file can be quickly and easily edited. In this instance, Gill made the necessary edits, but this took less than 30 minutes and did not involve any complex editing. Anyone with basic Adobe Illustrator skills, such as those covered in the 2017 workshops, would be able to accomplish the same edits. The first step is to save the Illustrator file under a new name, so that the original file can be returned to, if necessary. The sphenoid bone is not required in the final image and so the visibility for that layer is switched off, as shown below. 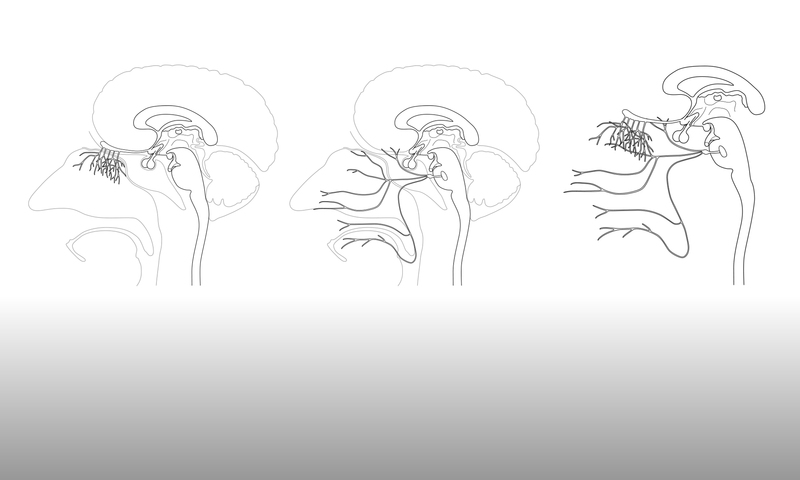 As the brain image is simply providing the background context for the dopaminergic pathways, the line weight for the black outline of the brain is reduced to make it less visually intrusive, as shown below. The image then requires a little bit of editing to tidy it up and ensure that the outlines still tie together, but this only takes a few minutes. Pierluigi asked that the dopaminergic pathways use a colour scheme that matches the colours being used in another figure in the same article. He provided this figure as a pdf file that could be ‘placed’ into a layer in the Illustrator file, as shown below. This allows the colours to be sampled using the eyedropper tool and then applied to other elements. The visibility for the layer containing this ‘placed’ pdf file is then switched off, to remove it from the final image. The sampled colours are used to form a colour gradient, as shown below. This gradient is applied to the dopamine pathways, which Gill had drawn based on the original image that Pierluigi had identified in the instagram feed. The final edited image, with the dopaminergic pathways contained on a separate layer within the Illustrator file, is shown below. The pathways are not intended to be anatomically accurate, but simply to represent the movement of dopamine within the brain. This final figure was exported from Illustrator as a jpeg image file and provided to Pierluigi so that he could add any additional text and annotation. This figure provides a very good demonstration of how, with a little bit of effort, a basic image for the online library can be adapted to provide a specific figure that can be visually consistent with other figures in an article or presentation. This greatly improves the overall visual communication of the figures, when compared to using disparate figures that have completely different colour coding and visual styles. The edited image will be added back to the online image library, so that it is available for future use and can itself be adapted for inclusion in other figures.